Al Rayyan Stadium is one of the proposed venues for the 2022 FIFA World Cup to be held in Qatar. Image courtesy of Supreme Committee for Delivery & Legacy. Designs for the new stadium were unveiled on 22 April 2015 at a ceremony held in Al Rayyan’s Ali bin Abdullah Fort. Image courtesy of Supreme Committee for Delivery & Legacy. The stadium has been designed to honour its desert surroundings by featuring sand dune-like structures on its grounds. Image courtesy of Supreme Committee for Delivery & Legacy. The stadium façade is formed by the seamless integration of seven patterns that represent the Qatari culture. Image courtesy of Supreme Committee for Delivery & Legacy. Area around the stadium will include a mosque, aquatics centre, athletics track, cricket pitch, tennis courts and hockey pitch. Image courtesy of Supreme Committee for Delivery & Legacy. Al Rayyan Stadium is proposed to host matches to the quarter-final stages of the World Cup. Image courtesy of Supreme Committee for Delivery & Legacy. Al Rayyan Stadium is a proposed 2022 FIFA World Cup venue that will be constructed 20km west of Doha city centre in Al Rayyan, Qatar. With a capacity of 40,000 seats, it will be built on the site of Ahmed Bin Ali Stadium. Tottenham Hotspur Football Club is constructing a new 61,000-seat stadium in place of their existing White Hart Lane Stadium. 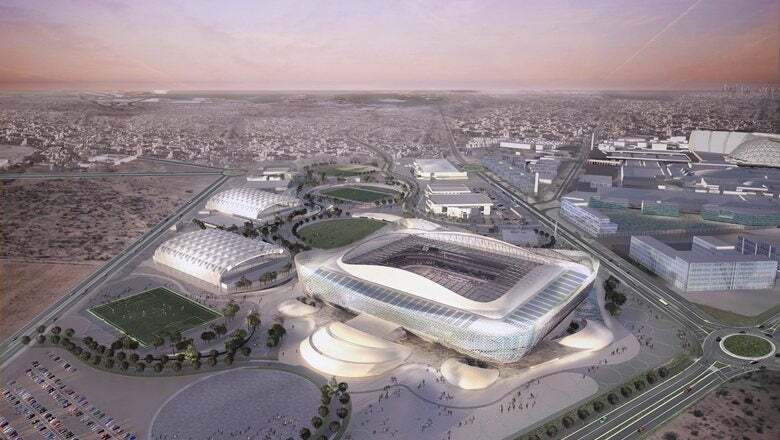 Designs for the new stadium were unveiled on 22 April 2015 at a ceremony held in Al Rayyan’s Ali bin Abdullah Fort, making it the fifth proposed venue of the World Cup. Qatar’s bid to host the World Cup comprised 12 stadiums, eight out of which are obligatory. The country will take a decision on the final number of stadiums by the end of the year. The Al Rayyan stadium will be constructed and delivered by the Supreme Committee for Delivery & Legacy (SC) with completion set for the first quarter of 2019. Construction of the stadium also involves development of additional facilities benefiting the region and surrounding areas. If chosen, the stadium will host matches to the quarter-final stages of the World Cup. The 2022 FIFA World Cup will be held in November and December 2022. The final match will be played out on 18 December, Qatar’s National Day. Designed to reflect the history and tradition of Al Rayyan and Qatar, the stadium will add value to the local architecture and culture of the region. Al Rayyan is known in Qatar as the gateway to desert, and the stadium has been designed to honour its surroundings by featuring sand dune-like structures on its grounds. These structures will be used as hospitality areas, concessions and other services. The stadium has been designed as a large tent in a desert landscape in accordance with the desert theme using circle packing geometry. A bowl cooling system has been designed for the comfort of the players and spectators, along with two giant screens and multi-function hospitality spaces. The stadium’s façade is formed by the seamless integration of seven patterns that represent the Qatari culture. Based on decorative motifs of Islamic architecture, these patterns reflect abstract shapes. The patterns have been selected to represent different aspects such as the family values in Qatari culture, beauty of the desert, flora and fauna that grows there, and international trade that is a pillar of the country’s economy. All the aspects are merged by a shield pattern that symbolises loyalty, unity and perseverance, which are some of the key qualities of a successful football team. Area around the stadium will feature a number of facilities, including a mosque, aquatics centre, athletics track, cricket pitch, tennis courts and hockey pitch. Floodlights and cooling facilities for the football training pitches will be available throughout the year. Landscaped grounds will house a skate park, cycling track, running track and outdoor fitness equipment and will feature winding cooled, covered walkways. The region’s premier sports medical facility Aspetar and a FIFA Medical Centre of Excellence will be constructed as part of the stadium’s outdoor facilities. A metro link currently under construction will connect the Al Rayyan stadium to the Mall of Qatar in less than 5min. Different features have been incorporated in the design of the stadium to reduce the carbon footprint, such as renewable energy generation, lightweight building design, careful selection of materials, and energy and water-efficiency measures. "Designs for the new stadium were unveiled on 22 April 2015 at a ceremony held in Al Rayyan’s Ali bin Abdullah Fort, making it the fifth proposed venue of the World Cup." Recycled materials from the deconstructed Ahmed Bin Ali Stadium will be used to construct the stadium, while some of the recycled materials will also be used to create and install public art. The stadium is vying for certification from both the Global Sustainability Assessment System (GSAS) and Leadership in Energy and Environmental Design (LEED®). Seating capacity of the stadium will be reduced to approximately 21,000 after completion of the World Cup. The modular upper tier will be gifted to nations that are looking for sporting infrastructure. After reducing the capacity and altering the design, the stadium will become the new home of one of Qatar’s most popular and eminent football teams, Al Rayyan Sports Club. A consortium of Ramboll and Pattern Design was selected as the design consultant for the project. AECOM will be the project manager for the stadium construction. A joint venture of Manco W.L.L. and Buckingham Group Contracting was contracted for early works and deconstruction activities.